If you’re reading this post and you’ve landed on my page, it’s already a safe bet that you like good beer. It’s also probably a fairly safe bet that you may be a baseball fan as well. If you love beer and baseball, and more specifically, if you love Karbach Brewing beer and the Houston Astros baseball team, I have a treat for you. 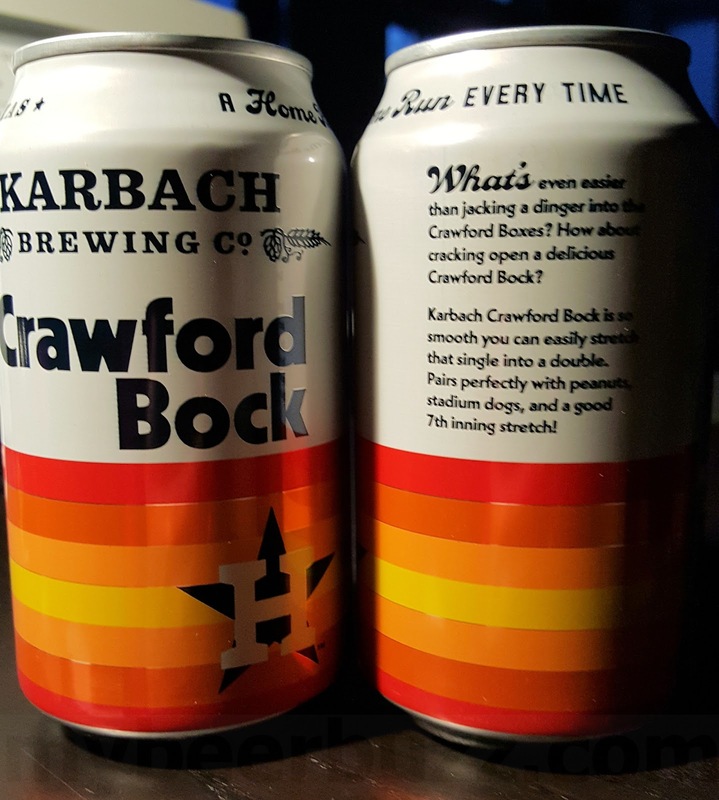 Today we’re sampling the new Crawford Bock from Karbach Brewing in Houston, TX. This beer is a collaboration with Houston Astros baseball and as you’ll see, it’s not only a good beer, but a beer that gives back to the Houston community. A portion of the sales of Crawford Bock will benefit the Astros Foundation and their community initiatives. While I know baseball season has not started for 2019, I simply couldn't wait to pop open a Crawford Bock and get ready for opening day….so off we go. Crawford Bock pours a deep amber color with a bit of caramel malt and nuttiness in the aromas. There are subtle hop aromas on board as well and the overall nose is enticing. The flavors of a traditional bock-style beer are there with a prominent malty palate, a bit of soft nuttiness and a clean balanced hop finish. I liked the caramel and subtle toffee notes and the clean mouthfeel that balances it all out. Crawford Bock is a really drinkable beer at 4.5%-AbV and I can only imagine how satisfying this will be to taste at the ballpark on a hot Texas night. Karbach Brewing Crawford Bock debuted at the 2019 Astros Fan Fest in Jan and it will be available the first week of March at the ballpark and in Karbach Brewing’s Texas footprint. Get out there and try Crawford Bock for yourself, and better yet, pop open a 12oz can while you watch the Houston Astros. And when you do try this beer, be sure to let us know what YOU think.